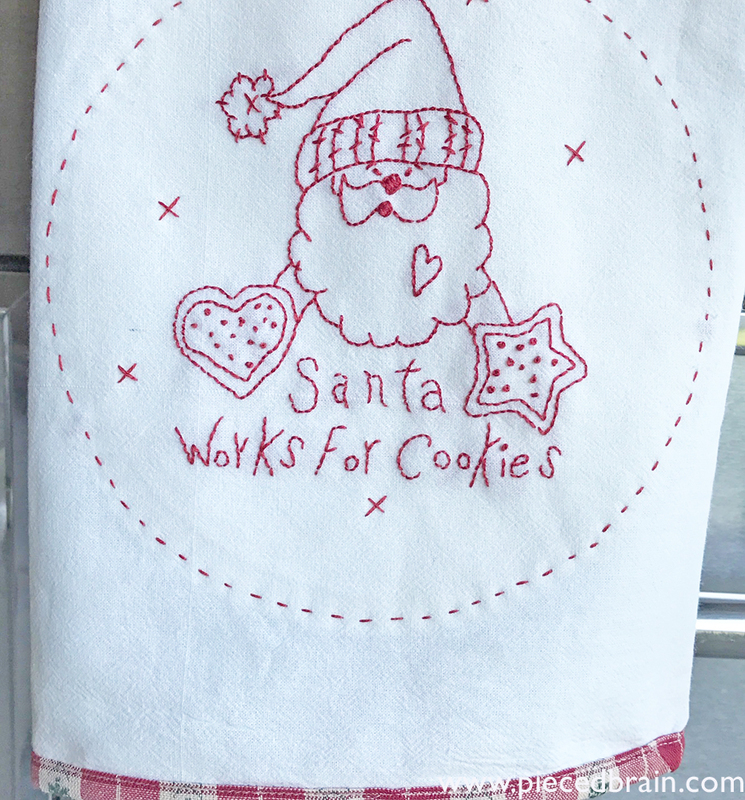 I have missed doing embroidery and am so happy I worked on this tea towel. It will adorn my kitchen at Christmas (at the rate we are going it will be in my kitchen very soon!). Flour sack, floss, and a bit of fabric for the binding and backing is all it took. The embroidery was done with DMC floss #347, a red which is not too bright. Its color actually matched the red on the binding, an unexpected bonus. I love the texture and durability of flour sacks. 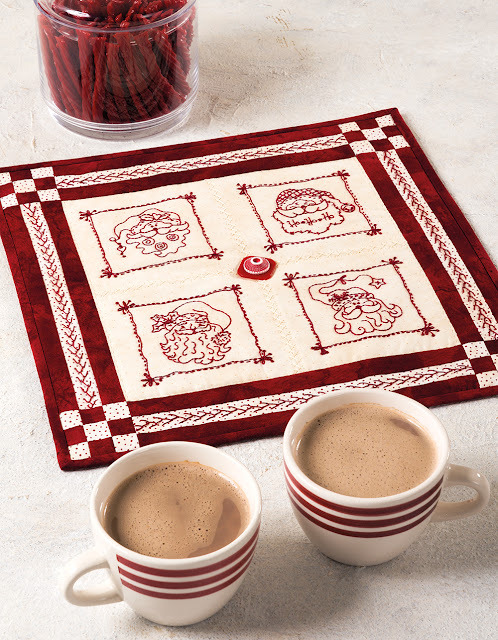 They are very popular in Brazil for kitchen towels and accessories: we paint them, dye them, add crochet edgings to them, embroider them, etc. 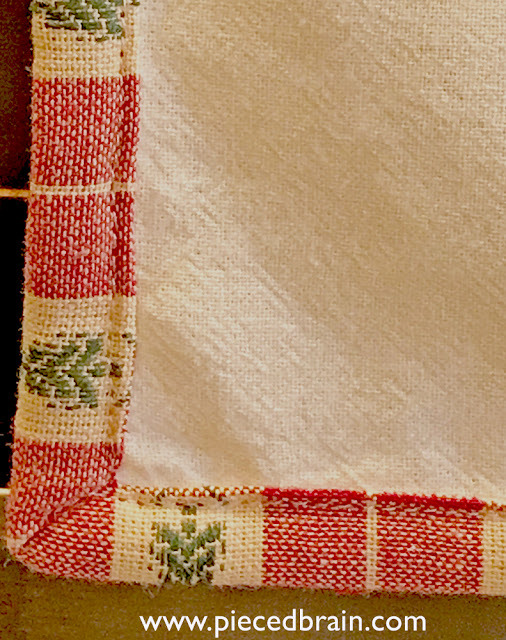 They have always been a fixture in my kitchen, as I resisted purchasing towels made with other fabrics regardless of how pretty they were. Other fabrics don't seem to absorb water as well or, maybe, I just like the memories they bring back from my mom's kitchen. I added the binding because I thought it needed a frame. 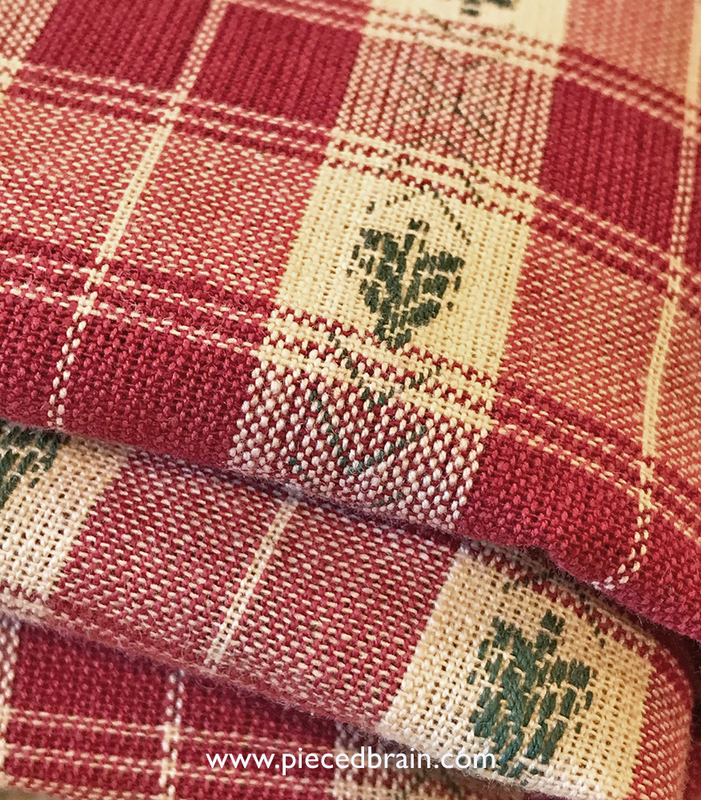 This fabric from JoAnn's (in my stash for 4 years now) was a perfect choice! The weave is open and complements that of the flour sack. I've used it before on another Christmas project (see it here for tutorial). This is the back of the towel. 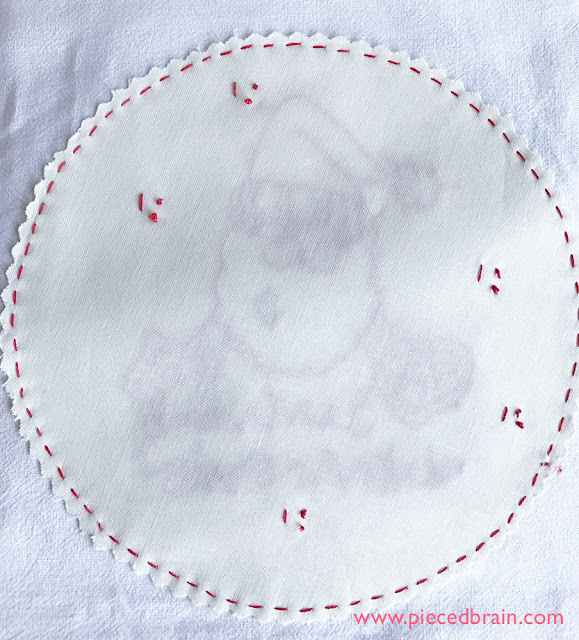 I wanted to hide the less than perfect wrong side of the embroidery work so I cut a circle from a solid fabric using the pinking Olfa blade (when washed it will fray a tiny bit, adding more texture! ), pinned it, and stitched it using a straight stitch. I added five crosstitches on the front to further secure the circle. It would make a great gift in a basket along with a jar of jam and Christmas cookies (Guess why you cannot see the cookies in the basket...). No chance, though, as this one is mine. I do love that embroidery design. I got it from the book Just Be Claus - 24 Jolly Holiday Embroideries by Robin Kingsley. 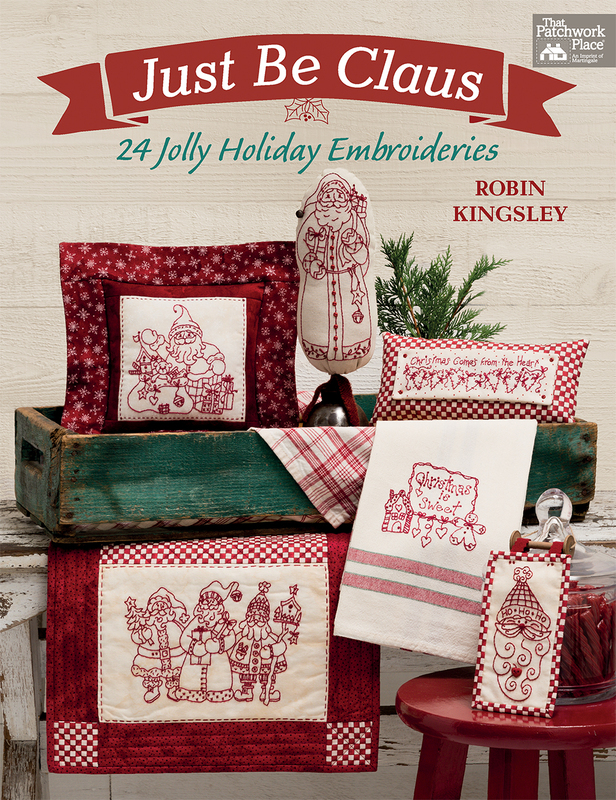 This book has delightful mini pillows, mini quilts, table runners and other small, quick Christmas projects. 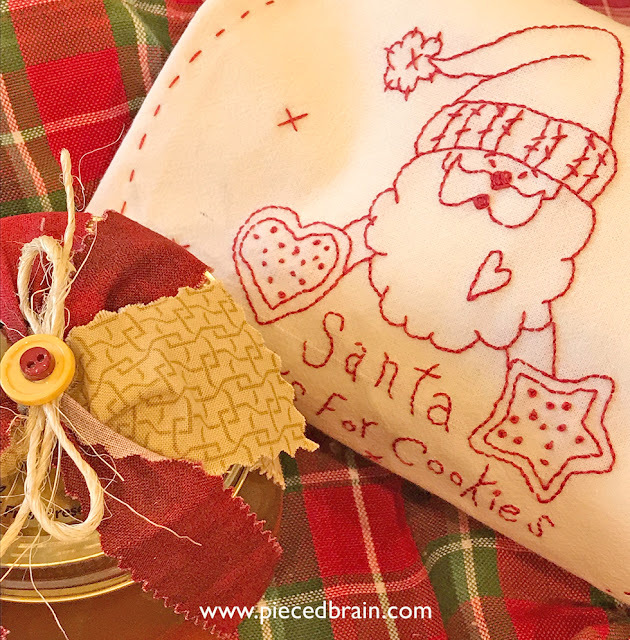 Robin's whimsical designs feature items from Christmases of my childhood: toys, traditional Santa figures and ornaments, cookies, Christmas trees, and love (hearts). Looking through the book was akin to taking a journey back in time... and my fingers were itching to embroider everything. Robin's St. Nicks - round, red, jolly - reminded me of my mom's sister who used to dress up as Santa and come downstairs at midnight on Christmas Eve, carrying over her shoulder a huge bag filled with toys for us. What a party it was! When I saw Robin's tea towel I had to make one. Hers has more detail on the letters (my French Knots aren't up to snuff lately, so I omitted them from the words). 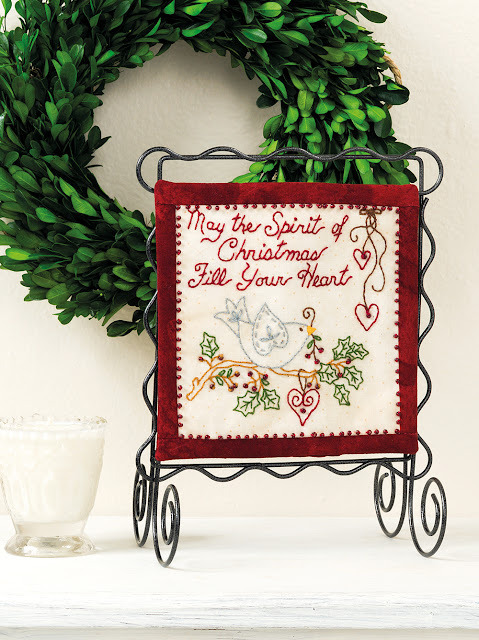 Each of the 24 projects in the book will add Christmas cheer to your home, or may become a treasured gift to a friend. 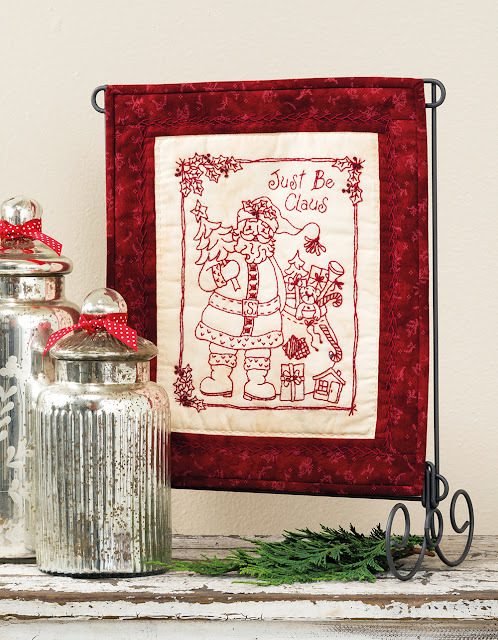 The embroidery uses basic stitches such as Backstitch, French Knots, Daisy stitch, Cross stitch, Buttonhole stitch and others, yet you need not worry - there is a section at the end of Just Be Claus called "Embroidery Basics" with instructions for each stitch, as well as information on all the necessary supplies. One of my favorite elements in this book: the designs indicate which stitch to use where, providing a quick reference guide for when, with needle in hand, we are ready to move to a different section. Thanks to Robin's talent, my kitchen will be even more inviting at Christmas. Her passion for embroidery shows in the details of each design, and in how she uses them in the projects. You can tell she had a lot of fun creating them! 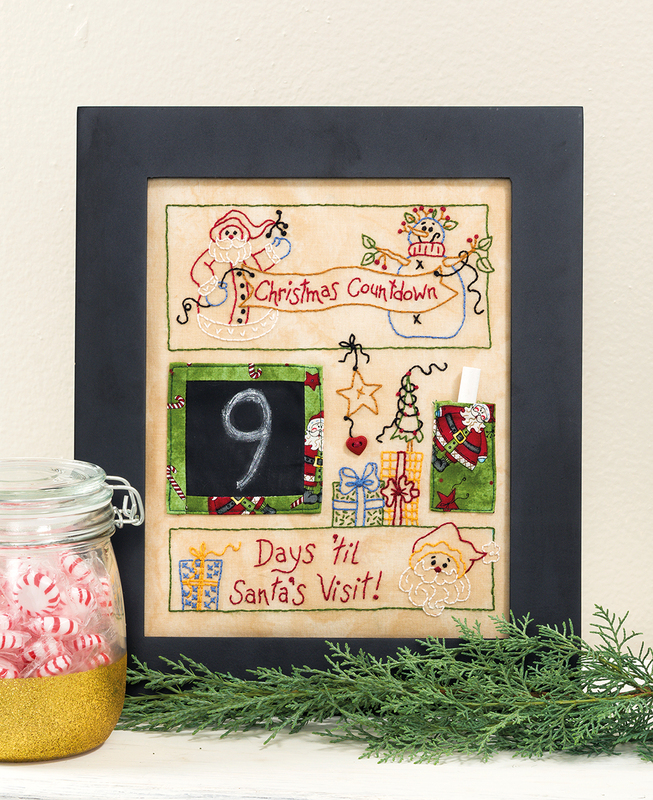 Make them yours by showcasing holiday fabrics from your collection, changing stitches, or adding colors. When you are ready to take a break from the summer heat, step inside, gather your supplies, pick a pattern from this book, and do what I did: listen to an audio book with your feet up, and let your fingers do the pretty work. Because pretty it will be!